A psychiatrist (Paul Michael Glase, TV’s Stasky & Hutch) gains publicity for his unorthodox methods of treating people’s phobias. 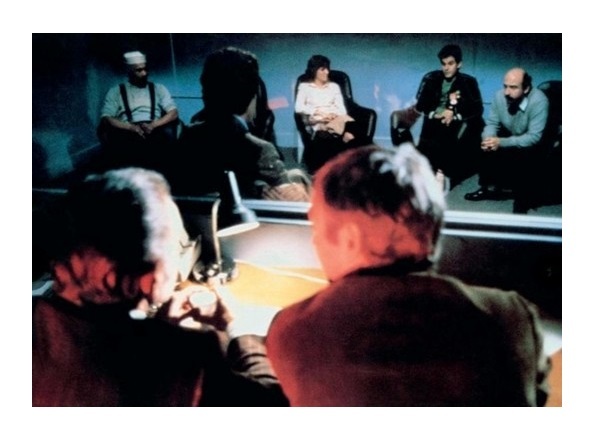 When his patients begin to die one by one, a cop (John Colicos, Anne of the Thousand Days) is convinced that the deaths are connected to the psychiatrist’s unusual therapy sessions. Celebrated Oscar-winning director John Huston’s (The Treasure of Sierra Madre) only horror movie, a sort of American giallo, has been described as the filmmaker’s worst movie, but I didn’t think it was that bad. Phobia has an interesting premise, but it’s all too apparent that Huston is out of his comfort zone. 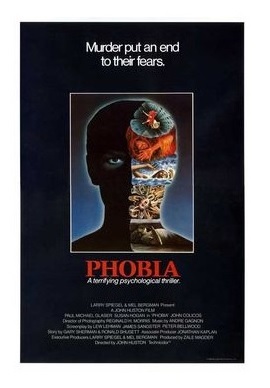 Phobia is the kind of thing Brian De Palma did in his sleep. Huston, on the other hand, struggles to infuse life into the material. It isn’t, or course, a question of talent; the movie was made by people who knew movies. The writing team included Dan O’Bannon and Ronald Shusett, who had just finished working on a little film called Alien. Never mind that, these talented people failed to produce a high-quality movie. As I said before, the idea is very, very interesting, but the murder sequences are poorly staged. I was taken aback by how ineptly edited some scenes were — the bad editing and poor camera placement kill any chances of creating genuine suspense. It really makes you appreciate the work of people like De Palma, John Carpenter, etc., more. The therapy sessions were intriguingly designed, though. I’ve read that Huston, and his long-time assistant and collaborator Gladys Hill (Reflections in a Golden Eye and The Man Who Would Be King), worked very hard on this aspect of the movie. It’s too bad that the rest of the film isn’t as good as these sequences. Paul Michael Glaser, in his first and only starring role in a theatrical film, is just okay. Unfortunately, the failure of the film killed his film career at the outset. He had better luck behind the camera — Glaser directed moderately successful movies like The Running Man and The Cutting Edge. John Colicos is very good as the cop investigating the mysterious deaths. Susan Hogan (The Brood) plays Glaser’s love interest. After so many years in the film industry, I’m sure director Huston thought it was time to try something different. I’m assuming Huston was trying to challenge himself. However, Phobia doesn’t work (it was a critical and financial disaster), but fans of Huston’s work don’t want to miss the master’s only horror movie. I usually don’t say this, but I wouldn’t mind seeing a remake. As I said before, the premise of the film is rather cool/interesting. A real curio for sure. P.S. You can watch it on Youtube. It’s a long time since I’ve seen this: you’ve whetted my appetite for an overdue revisit! No way I didn’t realise Glaser directed Arnie in “The Running Man”! Looking to see what else he directed brought me straight to “Amazons”!!!! “A secret cult of beautiful large breasted female warriors plot to take over the world” Sounds amazing. Hehe. Sorry, as usual my comments run away with me. Never heard of “Phobia”. The poster is incredible. Wow it gets a slamming on the IMDB score. Good that wasn’t John Huston’s last film! and he got to make the fun “Escape to Victory”. And just looking I’ve never seen or heard of “Under The Volcano” or “The Dead” which both get very good reviews. Victory is fun. Volcano is an excellent character study. The Dead is a Xmas favorite! (yes, despite its title, it is a heartwarming movie!). Thanks Eric I will look forward to seeing each. Well I wasn’t expecting The Dead, from it’s title, to be heartwarming tale. Maybe I will try and watch it around the festive period.